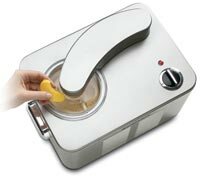 Long Description Housed in brushed stainless steel with an embossed logo, this fully automatic small appliance makes up to 1-1/2 quarts of frozen yogurt, sorbet, or homemade ice cream in less than an hour, with no waiting between batches. Due to its built-in commercial-style compressor freezer, prefreezing is not required--just add ingredients, set the 60-minute timer, and the machine takes care of the rest. The unit provides precise temperature control and mixes efficiently to ensure excellent results, and its built-in timer automatically stops the machine when the ice cream is ready to enjoy. For added convenience, its transparent lid features an ingredient spout, and the lid, paddle, and bowl remove for easily washing by hand. An instruction/recipe book comes included. The ice-cream maker measures 15-1/2 by 10-3/4 by 10-1/2 inches and carries a three-year limited warranty.